Chef Ulf Braunert of Jasper at the Palace Luzern has many reasons to smile. 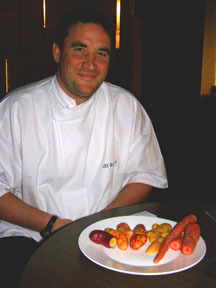 He is doing what he loves, and since his arrival in March 2006, has earned 16 GaultMillau Points. This dedicated chef from Germany told me that he not only loves cooking but that his "destiny is cooking. I like to stay at the oven. I like to peel the carrots, cut the carrots, and cook the carrots." He started asking his mother questions about cooking when he was about 10 or 11 years of age. When she asked him if he wanted to help her, he declined, but kept asking her questions. By the time he was 12 years old, he started working in restaurants on holidays and then decided that he wanted to be a chef. He worked at Giardino in Ticino, Switzerland near the Italian border for two years as a Sous Chef, worked at The Orchards in Massachusetts in the United States, and returned to Giardino for five years as a Chef before joining Jasper. His concept for the restaurant is a little bit of everything with a Mediterranean focus for the international clientele. He likes light cooking, and using oils, vinegars, and not a lot of spices, but likes to use many fresh herbs, woods and to make his own curries. He holds special cooking classes four times in the fall and four times in the spring, but guests can request cooking classes at any time. He changes the menu every month, uses only seasonal fruits, vegetables and mushrooms, and buys local meat from the farmers. He has a special supplier for his cheeses, and likes to buy things that are not available for everyone to really create a unique experience for the restaurant guests. He is always looking for new products, and recently found a yellow fingerling potato with red spots from Peru, and red carrots that retain their color after cooking, and enjoys creating news ways to use new products. Chef Ulf enjoys drinking wine and two years ago he created a special wine dinner, where he used all of the wine ingredients: the wood, the grape leaves, and the must from the pressing to marinate and poach the venison before adding the wine to the meat. In his free time, he enjoys golfing with his wife, fishing, cooking for his friends, and after 21 years of cooking, he is still asking his mother cooking questions. He shares three seasonal pumpkin recipes from his latest cooking class, and a delectable recipe for Risotto with Porcini Mushrooms. Method for the mushrooms: Clean the mushrooms (do not wash! ), and cut into slices or pieces. Heat the olive oil in a skillet, add the mushrooms, and sauté until golden brown. Season with salt, pepper, and a little caraway, add shallot and garlic, and cook quickly. Add the chopped parsley or chives and set aside. Method for the risotto: Heat a pan and lightly sauté the shallot and garlic in olive oil. Stir in the rice, reduce heat, and cook for 2 minutes. Add the white wine, thyme, and saffron, and bring to a boil. Little by little, add the broth. Stir occasionally until the risotto is done (it should still be al dente), season with salt, pepper, grated Parmesan, and mascarpone. Let the risotto rest for 2-3 minutes, add the mushrooms, and bring to a boil while stirring. Serve. Method: Put pumpkin cubes in aluminum foil and bake in the oven until tender. Remove the aluminum foil, and place in a cheesecloth overnight. Puree the pumpkin, add the butter and the semolina, and cook until it makes a soft paste. Let it cool, and then add the egg yolk, and some Parmesan cheese if desired, and knead to form a dough. Cut the dough into gnocchi shapes and cook. Method: Cut the pumpkin into cubes and sauté in butter 3-4 minutes until they start turning a deeper color. Add the onion, garlic, and ginger and cook for 2 minutes. Add the curry paste and the chili pepper, and let cook for a few minutes to let the flavors meld. Add the chicken stock and bring to a boil. Reduce the temperature and gently simmer. 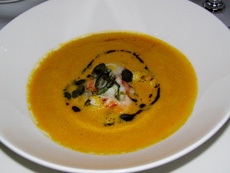 When the pumpkin is tender, puree and add the coconut milk, season to taste with salt and garnish with basil leaves. Method: Peel the pumpkin, and cut into cubes, add the remaining ingredients and bring to a boil. Place in a sterilized jar and let rest 2-3 days before using. Read other articles on the Palace Luzern and the Palace Spa in the Destinations, Hotels and Resorts, Restaurants, Spas, Chefs' Recipes, and Adventures sections. The Palace Luzern is part of the Victoria-Jungfrau Collection, www.Victoria-Jungfrau-Collection.ch. Read other articles on Switzerland in the Destinations, Hotels and Resorts, Restaurants, Chefs' Recipes, Spas, Liquor Cabinet, Wine Cellar, and Adventures sections. For information on Switzerland, please visit: www.MySwitzerland.com. For information on Lucerne: www.Luzern.org. For information on Interlaken: www.InterlakenTourism.ch. For information on Bern: www.BernInfo.com. For information on Zurich: www.Zuerich.com. For information on Swiss International Air Lines: www.swiss.com. For information on Swiss Pass: www.SwissTravelSystem.ch. © December 2006 Luxury Experience www.LuxuryExperience.com All rights reserved.